For the honeycomb, line a large baking tray with non-stick paper. Put the sugar, syrup, vinegar and 150ml water in a large pan. Heat gently to dissolve the sugar completely. Cover the pan and simmer for 2 minutes. Take off the lid and boil it until amber-coloured. Sift in the bicarb, stir quickly to combine and pour it into the tin. Leave to cool. Break into shards in a mix of fine and chunky pieces. Whip the egg white and fold it into the mousse with 3 tbsp crushed honeycomb. Set aside in a bowl in a cool place (preferably not the fridge or it will set too hard; if you do chill it, allow it to come up to room temperature before using). 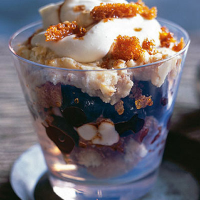 In pretty glasses, layer the biscuits, cherries, some honeycomb, the cream and the mousse. Finish with a few shards of honeycomb.